How Do You Reverse Into a Parking Space? I utilize the two-step in blue nearly exclusively. Not due to size, ease, space, or anything like that. It just happens to match my driving philosophy/style. 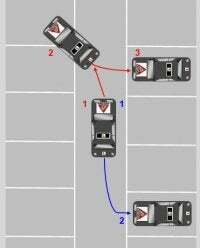 The figure in red is the most common, easiest, and only way to reverse park if you have a car behind you. Now that you all know this isnt a right or wrong deal, I was curious if anyone besides myself does the method in blue?